Heriot’s president Kevin McLaren heaped praise on the battling qualities within the squad and applauded Hayes van der Berg’s superb century as they lifted the CSL Eastern Premiership title on Saturday in dramatic circumstances. The Capital side had been behind Arbroath for most of the summer, but going into the final round of fixtures they knew they still had a chance of finishing top. For that to happen they had to hope that Carlton would do them a favour and beat Arbroath and then go on and beat Aberdeenshire themselves. It was around 7pm when news filtered through to Goldenacre that Carlton had done the business at Grange Loan and then, half an hour later, Michael Shean took the final Aberdeenshire wicket and Heriot’s were champions. Cue the celebrations and, taking a break from being drenched in champagne, McLaren, who played in the match, said: “What an amazing feeling. 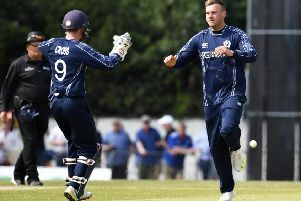 The 36-year-old continued: “Going into this final game against Aberdeenshire we knew we just had to focus on ourselves and the innings played by Hayes van der Berg to get his century was just brilliant. “It is not a time to single out individuals, but everyone who watched Hayes play this innings knows just how good he is. The game was shortened to 45 overs-a-side due to morning rain Heriot’s made a solid 218-6 batting first. That was mainly based on 102 by South African Van der Berg, the century taking him to 548 runs for the league season. All-rounder Mark Watt also made 69, giving 537 runs for 2017. At the same time Arbroath, who had seen the start of their with Carlton across Edinburgh delayed until 2.30pm, were struggling and fell 120 all out. In the 35 overs-a-side contest Arun Pillai led the way with three wickets for Carlton, Omar Ahmad and Ruari Macpherson chipping in with two scalps apiece. Carlton’s Rory McCann then hit 60 not out to push the Citylets Scottish Cup champions to an eight wicket victory. Back over at Goldenacre, Heriot’s knew that the key wicket for them to get was going to be that of Aberdeenshire skipper Chris Venske. It was fitting that skipper Morton took that wicket, caught by Van der Berg for 84, to leave the visitors on 148-8. There was then a run out before Shean bowled Findlay Anderson as Heriot’s won by 45 runs. Morton said: “I really cannot quite believe it. “We knew at the start of the day that we might have a chance, but we weren’t sure if Carlton would suffer a Scottish Cup hangover or not and Arbroath are a good side. “We heard what had gone on at Grange Loan and then we had to keep our cool and take the last few wickets. Heriot’s will now play West top-flight champions Prestwick at Ferguslie this coming Saturday in the national final. Watsonians defeated Falkland, SMRH lost at Tayside Group Forfarshire and Mazars Grange’s match at Glenrothes was off. There was drama in the Baillie Giffford ESCA Championship, Edinburgh snatching the title from RH Corstorphine. Edinburgh won against Carlton II while RH Corstorphine slumped to defeat at Dunnikier. A crumb of comfort for RH Corstorphine is that they will still be involved in the play-off match for promotion against Stoneywood-Dyce at Falkland this coming weekend, Edinburgh not able to go up to the top flight. Sunday’s national T20 finals day, involving Watsonians, was postponed.